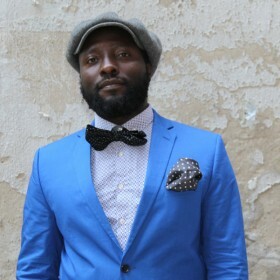 Born in 1977 in Yaoundé, Cameroon, is an independent art curator and biotechnologist. Ndikung has been living on and off in Berlin since 1997, where he studied Food Biotechnology in the University of Technology Berlin, did a doctorate in Medical Biotechnology in the Heinrich Heine University Düsseldorf/TU Berlin and a post-doctorate in Biophysics in Montpellier. He is the founder and artistic director of the non-profit art space SAVVY Contemporary Berlin – a laboratory for conceptual, intellectual, artistic production and exchange that takes up the challenge of investigating the ‘threshold’ between, as well as critically reflecting on and questioning discourses around the “West” and the “non-West”. SAVVY Contemporary was winner of the Berlin Senate’s Prize for art spaces 2013. Ndikung is initiator and editorin-chief of the „SAVVY Journal“, the first bilingual e-journal for critical texts on contemporary African art. In 2014 alone Ndikung was Co -Curator of the group exhibition „If You Are So Smart, Why Ain’t You Rich? On the Economy of Knowledge“ for the Marrakesh Biennial Satellite; the exhibition and research project Giving „Contours to Shadows“ in the n.b.k., Gorki Theater Berlin, Gemäldegalerie, SAVVY Contemporary and 5 satellite projects in Lagos, Dakar, Johannesburg, Nairobi, Marrakesh and the exhibition and symposium „The Ultimate Capital is the Sun in the nGbK“. Upcoming projects include the year long art project „An Age of our Own Making“ in 2016 – a series of exhibitions in the framework Images 2016 in Holbæk, Roskilde and Copenhagen, co-curated with Solvej Ovesen. He works together with Solvej Helweg Ovesen as chief of Galerie Wedding, Berlin.